U.S. Sen. Jim Inhofe won’t even let the deadly Ebola virus get in the way of one of his political stunts. Last week, Inhofe single handedly but temporarily held up $750 million in federal funding for the Department of Defense to fight the Ebola virus in West Africa. The House had earlier approved the funding but when it came to the Senate, Inhofe, a ranking Republican member of the Armed Services Committee that considered the legislation, held it up. Inhofe cited concerns about what he later called a “lack of a coherent strategy” about how the funds would be used. Meanwhile, as Inhofe equivocated, Ebola cases have appeared in the United States, and the outbreak in the west African countries of Liberia, Guinea and Sierra Leone continues to kill a growing number of people.
. . . because of the failure of the Obama Administration to responsibly and strategically plan in advance for how the U.S. will be involved in West Africa, it will be difficult for me to support any further last-minute funding requests using military resources. That is why I have insisted another more appropriate funding source be identified for operations beyond six months. Significant cuts to the defense budget have eroded the readiness and capabilities of our military, and I cannot support the indefinite commitment of our troops to this mission. So try to follow Inhofe’s logic. The Obama administration was slow to respond and strategically plan so, in response, Inhofe decides to delay things even further. It doesn’t make sense because Inhofe’s real point is really to just criticize the president in an election year. Politicizing the Ebola virus may well be a new low for Inhofe, but I would have to do a thorough search through my memory bank to be entirely sure. People are dying after contracting the Ebola virus even as I write this, and Americans are increasingly worried about a major outbreak here, but that doesn’t seem to affect Inhofe. Note the other contradiction in Inhofe’s statement. If defense cuts have actually “eroded the readiness and capabilities of our military,” which they haven’t, then wouldn’t it make more sense to actually be immediately in favor of more and not less funding for any type of military operation? Wouldn’t that help our “readiness”? Shouldn’t the military be “ready” for virus epidemics? The Defense Department, for example, had initially requested $1 billion. The money will come from an account used to fund military operations in Afghanistan. Inhofe’s political stunts continue to attract little to no criticism from the corporate media in this state, which is a shame because Inhofe is not a good ambassador for Oklahoma in many parts of the country and world. 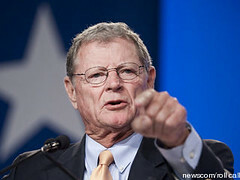 Perhaps we have all become so used to Inhofe’s extremism and political stunts that we’ve become numb or immune. Inhofe is expected to win reelection in November so it appears we’ll have to endure his right-wing extremism for another six years. So it goes in Oklahoma these days.